According to an article in mentalhealthamerica.net, clinical depression has become one of America’s most costly illnesses. Left untreated, depression is as expensive as heart disease or AIDS to the US economy, costing over $51 billion in absenteeism from work and lost productivity and $26 billion in direct treatment costs. Considering how much time we spend at work, it’s not surprising that our jobs can be adversely impacted by depression. 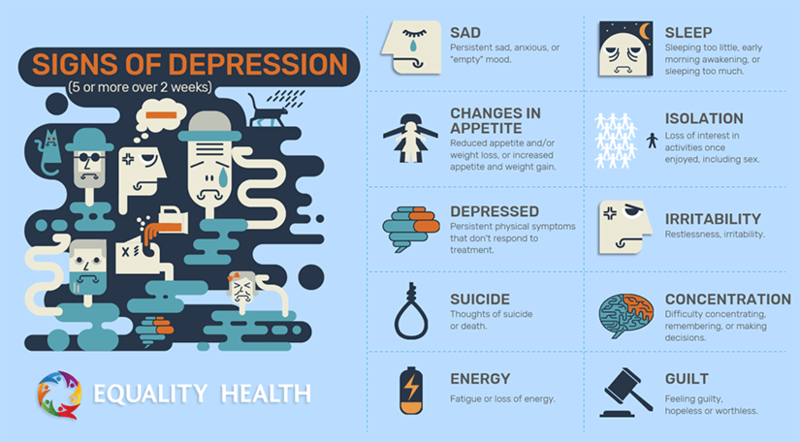 Depression tends to affect people in their prime working years and may last a lifetime if untreated. The good news is, more than 80 percent of people with clinical depression can be successfully treated. With early recognition, intervention, and support, most employees can overcome clinical depression and lead normal lives. Though there has been a stigma surrounding mental illness in the past, it is much more common than you might think. Oftentimes a depressed employee won’t seek treatment because they fear the impact it will have on their job and they’re concerned about confidentiality. Many employees are also unaware they have depression, or they fear their insurance is inadequate to cover costs. But most employers will refer a depressed employee for help if they’re aware of the symptoms, and 64 percent of National Mental Health Association survey respondents said they would refer an employee to an Employee Assistance Program (EAP) for treatment. Equality Health is one company that does just that. It offers an EAP with confidential professional counseling to help employees deal with life’s challenges and the demands that come from balancing home and work. These staggering statistics indicate how common mental illness is among employees, yet only 41% of adults with a mental health condition receive help. If an employee has five or more of the following symptoms lasting two weeks or more, they’re likely to be depressed. So, what are mentally healthy workplaces? Employers can be proactive in managing the mental health of their employees, whether they are experiencing a problem or not. Smart employers know that organizations are only as strong as their people and that the experiences, wellbeing and motivation of each worker are fundamental to how the organization performs as a whole. By positively managing and supporting employees’ mental wellbeing, employers can ensure that staff perform to their potential – allowing the business to achieve peak performance.